The Security Council today emphasized the need for a speedier deployment of UN military observers to Syria and the implementation of a proposed peace plan to end the violence in the Middle Eastern country. 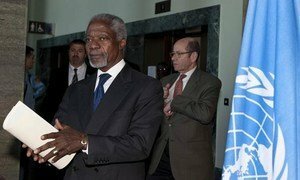 Council members were briefed on developments regarding Syria by the Joint Special Envoy of the UN and the League of Arab States for Syria, Kofi Annan, via video-teleconference from Geneva, and, earlier Tuesday, by the head of UN peacekeeping operations, Under-Secretary-General Hervé Ladsous. Addressing the media after Mr. Annan’s briefing, Ambassador Susan Rice of the United States, which holds the Council’s presidency this month, said the envoy had told Council members that the situation in Syria “continues to be unacceptable” and expressed concern that attacks resumed in locations directly following the departure of members of a UN observer team. The envoy described the attacks as “unacceptable and reprehensible, if true,” Amb. Rice said. The violence in Syria, which began in March 2011 as a protest movement similar to those across the Middle East and North Africa, has claimed over 9,000 lives, mostly civilians, and displaced tens of thousands. Last weekend, the Security Council authorized the establishment of the United Nations Supervision Mission in Syria (UNSMIS) – made up of up to 300 unarmed military observers and deployed for an initial period of 90 days – to monitor the cessation of violence, as well as monitor and support the full implementation of a six-point peace plan, put forward by Mr. Annan. Ahead of UNSMIS’ deployment, an advance team of 30 unarmed military observers was dispatched to liaise with the parties and to begin to report on the implementation of a full cessation of armed violence. The six-point proposal calls for an end to violence, access for humanitarian agencies to provide relief to those in need, the release of detainees, and the start of inclusive political dialogue that takes into account the aspirations of the Syrian people. According to Ambassador Rice, Under-Secretary-General Ladsous told the Council that 11 military observers are currently on the ground in Syria, and that UNSMIS’ Chief Military Observer will be deployed by the end of the week, with 30 observers expected by 30 April, and 100 observers within a month. The peacekeeping chief also said that the Syrian Government had refused one observer based on his nationality; and authorities there have indicated that they will not accept UNSMIS staff members from any nations are that members of the so-called Friends of Democratic Syria. “He [Hervé Ladsous] underscored that, from the UN’s point of view, this is entirely unacceptable,” Amb. Rice said. Top United Nations officials have stressed that Syria is at a “pivotal” moment following the Security Council’s authorization this weekend of a supervision mission, and called for a full cessation of armed violence in the country.